Astronomers with the Virtual Telescope Project captured this view of Tiangong-1 on March 28, 2018, using the Tenagra III "Pearl" telescope at the Tenagra Observatories in Arizona. 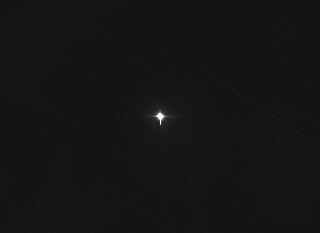 The image is a single, 2-second exposure captured at 8:35 a.m. EDT (1235 GMT). With just a few days left before China's Tiangong-1 space station is expected to come crashing down on Earth, astronomers captured this incredible view of the derelict craft zooming through space. The Virtual Telescope Project in Italy, together with the Tenagra Observatory in Arizona, used a robotically controlled telescope to provide live views of the space station during a webcast this morning (March 28). In this view from the webcast, Tiangong-1 is gleaming as the sun reflects off the spacecraft's surface and faint star trails streak across the background. "Our telescope honestly did out-of-this world work to track such a target," Masi told Space.com in an email. Tracking an object that swift "is something which very few observatories can do," Masi said, but the telescopes available at the Virtual Telescope Project and Tenagra Observatory were equipped for the challenge. The Paramount ME robotic mount installed on these telescopes is "the best hardware of this kind available in the world," the Virtual Telescope Project's website states. At the time the image was captured, Tiangong-1 was orbiting at an altitude of about 137 miles (220 kilometers). That's around half as high as the International Space Station, which flies at an average altitude of 248 miles (400 km) above the Earth. Tiangong-1's orbit is slowly decaying, and the station is expected to re-enter Earth's atmosphere sometime between March 31 and April 1, according to the European Space Agency (ESA). While most of the station will burn up in the atmosphere, some of its hardier components will likely survive the inferno and crash into Earth, experts predict. But there's no need to hunker down all weekend; ESA officials estimate that the odds of being stuck by a piece of Tiangong-1 are less than 1 in 300 trillion, and the station will most likely fall in the ocean. Email Hanneke Weitering at hweitering@space.com, or follow her @hannekescience. Follow us @Spacedotcom, Facebook and Google+. Original article on Space.com.